YES YES YES! I am such a muffin lover and these are a new favorite (I know I say that every time I make a new recipe…) They are light, fluffy, sweet and crunchy with a tasty streusel topping. I found this recipe from Sugar Spun Run and will definitely be making these again. The recipe is simple and easy and it definitely delivers! I am a big fan of baked goods that involve cinnamon so obviously love me some snickerdoodles. These cookies are INSANELY good and so easy. The recipe has you brown the butter before adding it to the mixture so it creates this really lovely nutty flavor. The cookies are so soft and chewy and I would 10/10 recommend. I found this recipe via Broma Bakery and she has a frosting to top the cookies but I decided to go frosting free. I didn’t want them to be overly sweet and they were so good by themselves. Happy Baking! Preheat the oven to 350°F. Beat the butter and sugar in an electric mixer until light and fluffy. 2-3 minutes. Add the eggs, one at a time, beating until each is fully incorporated. Be sure to scrape down the sides. In a large bowl, sift together the cake flour, cocoa powder, baking soda, baking powder, and salt. In another medium sized bowl whisk together the buttermilk, vinegar, vanilla extract, and red food coloring. Scoop into cupcake papers, about 1/2 to 3/4 of the way full. I always use an ice cream scoop and that helps to keep them even. Bake for 18-22 minutes or until a toothpick comes out clean. Rotate the pan after the first 15 minutes of baking to ensure even baking. I took one batch out after 18 minutes and they were TOO dry, that 16-17 minute was just right for me but all ovens are different. I think these may be the best brownies I have ever had in my entire life…bold statement I know, but true! They are super rich but the coffee and chocolate flavors blend perfectly together. OH MY GOD my mouth is watering just thinking about them. Broma Bakery has the best recipes! Happy Baking! Preheat your oven to 350 Degree F. Line a baking sheet with parchment paper or a baking mat. I honestly prefer parchment paper, I think the mats are kind of a pain to clean. Fold in your chips. This recipe called for white chocolate chips but I think they would be good with regular chips too! In a large bowl mix together your cake mix, oil, eggs until a dough begins to form. Cover the bowl and pop it in the freezer for 20 minutes minimum. Scoop out 2 tablespoons of dough and roll it into a ball; place on the sheet pan. Repeat the process with the remaining dough, spacing each cookie 2 inches apart. You will need to bake the cookies in batches. Bake for 11-13 minutes or until edges of cookies are set. Remove from baking pan and place on a cooling rack. Where are all my dry January folks? I have done dry January once when I was doing Whole30, and it was no walk in the park. As you all probably know I am a big wine lover, so not drinking for the month will be a change. From my last #dryjanuary I remember loving lots of sparkling water with lime, and hot tea instead of wine. This year I wanted to create a fun mocktail that I would be able to drink in case I wanted something a little extra. Enjoy friends! Put water and sugar in a small pot over medium high heat. Bring to a boil, stirring occasionally, until sugar is fully dissolved. Remove from heat and add rosemary sprigs.Cover pot and allow syrup to steep for about 30 minutes, until it is room temperature. Combine rosemary syrup, grapefruit juice, and club soda in a pitcher, or in individual cups and serve immediately over ice. 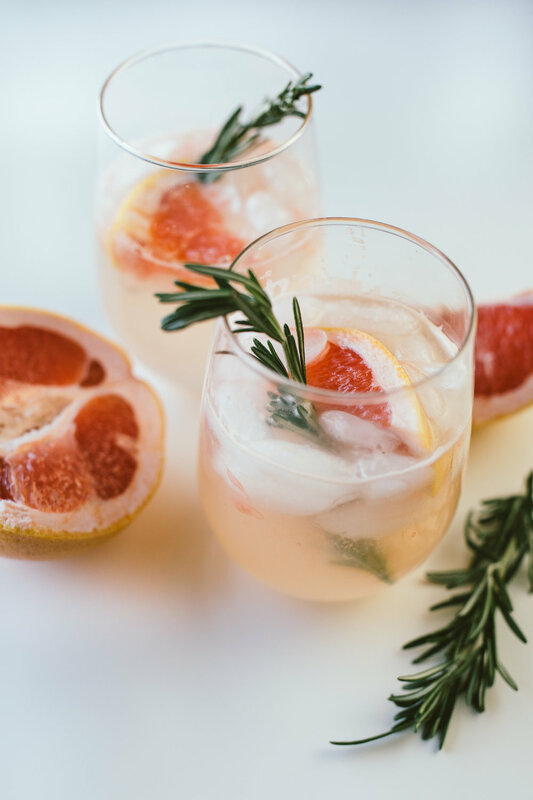 Garnish glasses with fresh rosemary sprigs and a slice of grapefruit if desired. I am officially beginning my healthy kick and this soup made my first day feel easy. It was creamy, rich with spice and the cauliflower topping made it feel hearty and filling. Would you believe me if I told you it is dairy free, gluten free, vegetarian, whole 30 approved, and paleo??? Happy cooking friends! Preheat your oven to 450 degrees F. Smash the garlic cloves with the side of the knife. Place the cauliflower florets and smashed garlic in a large bowl and drizzle with 2 tbs olive oil. Shake the bowl to coat the cauliflower in the oil. In a small bowl combine the tumeric, cumin, salt and crushed red pepper flakes. Sprinkle over the cauliflower and coat until combined. Place the cauliflower on a large rimmed baking sheet and bake in the center of the oven until browned and tender (about 25 minutes) Reserve one cup for topping. Meanwhile, heat a medium pot over medium heat, add 1 teaspoon oil and onion and cook until translucent, about 2 to 3 minutes. Add the broth and transfer the remaining roasted cauliflower to the pot, bring to a boil and cook covered on low 15 minutes. Use a hand blender (or regular blender carefully in batches) and blend until smooth. Salt to taste as needed, stir in coconut milk and serve topped with roasted cauliflower and cilantro with additional coconut milk for drizzling if desired. Makes 4 1/2 cups. Found this yummy recipe on one of my favorite sites Skinny Taste! I could eat soup everyday. I like all types and every time I eat it, it warms me up and makes me feel all sorts of cozy inside. I have fond memories of growing up and eating minestrone soup from the Italian deli up the block with crunchy melty grilled cheese on the side, so this recipe was one I knew I would love. The soup requires a lot of ingredients but I promise it is worth it and you can always freeze leftovers! Happy Cooking! Heat 2 tablespoons of olive oil over medium heat in a large, heavy pot or Dutch oven. Add pancetta and cook over medium-low heat for 6 to 8 minutes, stirring occasionally, until lightly browned. Add onions, carrots, celery, squash, garlic and thyme and cook over medium heat, stirring occasionally, for 8 to 10 minutes, until vegetables begin to soften. Add tomatoes, 6 cups of chicken stock or broth, bay leaf, 1 1/2 teaspoons salt and 1 teaspoon black pepper to the pot. Bring to a boil, then lower the heat and simmer uncovered for 30 minutes, until the vegetables are tender. Remove bay leaf and discard. Add beans and cooked pasta and heat through. The soup should be quite thick but if it’s too thick add more chicken stock. Just before serving, reheat soup, add spinach, and toss with 2 big spoons, like tossing a salad. Cook just until leaves are wilted. Stir in white wine and pesto. Add salt to taste, if needed. Serve with bruschetta and sprinkled with parmesan cheese, if desired. Combine the mayonnaise, mustard, Parmesan, salt, and pepper in a small bowl. Lay 12 slices of bread on a board and spread each one lightly with butter. Flip the slices and spread each one generously with the mayonnaise mixture. Grate the cheeses in a food processor fitted with the largest grating disk and combine. Pile 1/3 cup grated cheese evenly and top with the remaining bread slices, sauce side down. Heat a panini press or a pan with butter and cook until golden brown and melty! recipes courtesy of my homegirl Ina Garten! Do you love brownies? Do you love pie? If your answer was DUH, then you are in for a treat! I found this recipe from the Magnolia cook book, and everyone knows that Joanna Gaines can do no wrong. This recipe was easy, and so so tasty. Happy baking! Heat your butter and unsweetened chocolate in a small saucepan on low until it is melted and smooth. Remove the pan from heat, whisk in the sugar until smooth. Pour into a medium sized bowl and set it aside to cool for 10 minutes. Whisk in the eggs one at a time. Whisk in the flour, the vanilla, and the salt. Fold in the chocolate chips and the pecans. Pour into your pie crust. Cool to room temperature. Just before serving sprinkle with powdered sugar. Make the brown butter! Put the butter in a small sauce pan and cook until it turns slightly brown and produces a nutty smell. Don’t take your eye off it though, it can happen fast! Add both sugars to the brown butter, and mix on medium speed with a hand mixer until well combined, about 2 minutes. Add the eggs and beat for another 2 minutes, until the mixture has lightened in color. Add the vanilla, and beat for 30 seconds. With the mixer on low speed, slowly add the flour mixture. Add in the chocolate chips, I use semisweet. Pour the mixture into the prepared pan and bake for about 35-40 minutes, until a toothpick inserted into the center comes out clean. Cool on a wire rack, and cut into squares. I haven’t posted a savory dish in FOREVER so I wanted to share a special one with you all. I always say if I could pick my final meal it would be braised short ribs and polenta. I love when short ribs are so tender they fall off the bone, and polenta has always been one of my favorites. I found this recipe in Ina Garten’s new book and the recipe calls for 5lbs of short rib….so make this for a dinner party and share it with friends! Unfortunately my short ribs were a bit fattier than I anticipated so I had to sort through the ribs to discard the fat….so when you are shopping look for meaty ribs. The flavors were phenomenal and the sauce was BEYOND yummy. The polenta paired perfectly and I crumbled in some goat cheese for extra creaminess. Enjoy! PS. This recipe takes a few hours so get ready to dedicate some time. Preheat the oven to 425 degrees F, place the short ribs on a sheet pan. Brush the tops of the short ribs with olive oil and sprinkle with 1½ Tbsp salt and 1½ tsp pepper. Roast for 20 minutes and then turn down the oven to 325 degrees F.
Heat up 1/2 cup of olive oil in a dutch oven over medium heat. Add the leeks, celery, onion and carrots and cook on medium for 20 minutes, stir occasionally. Add garlic and cook for 1 minute before adding the wine. bring to a boil, reduce heat to medium and simmer 10 minutes, until liquid is reduced. Add stock, tomatoes, beer, thyme and 1 Tbsp salt and 1½ tsp pepper. Yes there is a lot of booze in this, but hey, it’s Friday. Add ribs to pot along with juices and seasonings from sheet pan. Bring to a boil, cover, and cook in oven 1 hour. Uncover and cook for 1 more hour, until meat is very tender. Transfer short ribs to a plate with a slotted spoon; discard thyme bundle and any bones that have separated from meat. Simmer sauce on stove for 20 minutes. Skim some of fat off top; discard. Return ribs to pot, heat 5 minutes, and taste for seasonings. I used Bob’s Red Mill Polenta Corn Grits…so to be honest I don’t really know if they are considered polenta or grits but regardless they were super tasty. I followed the cooking instructions for the polenta/grits and then added in 2 cups of half and half, 4 tsp of salt and 3 tbsp of unsalted butter. Threw some goat cheese in there and was pretty satisfied. Oh pasta I love you so! I ususally don’t make pasta dishes unless it is for a dinner party but this recipe was a hard one to pass up. Thank the lord for Giada de Laurenntiis for being the pasta queen, she knows how to do it. This recipe was SUPER easy and packed with flavor, perfect for a week night dinner or just a good old carb craving. Bring a large pot of salted water to a boil over high heat. Add the pasta and cook until just short of al dente, 10 or 11 minutes. Meanwhile, heat a large straight-sided skillet over medium heat. Add the butter and olive oil to the hot skillet. When the butter is melted, add the garlic; cook, stirring often, until soft and fragrant. Add 1/2 cup of the pasta water, then reduce the heat to low. When the pasta is ready, lift it out of the water and add it directly to the sauce; reserve the pasta water. Sprinkle the Parmesan over the pasta and stir to combine. Return the heat to medium, add the mascarpone, lemon zest and 3/4 teaspoon salt and toss well. Continue cooking until the pasta is al dente, another minute or two, adding pasta water as needed to thin the sauce. Add the peas and lemon juice; toss well to combine. Add more pasta water as needed to reach the desired sauce consistency (you will most likely use about 1 1/2 cups pasta water in all). HOLY MOLY these cookies were a big winner. I hate to admit it but I am normally not a HUGE fan of cookies that don’t involve chocolate, so I was a little bit skeptical. This recipe came from Gimme Some Oven and they are absolutely perfect for the holidays. They made my apartment smell divine and were pretty simple, definitely take the time to make these goodies! I actually halved the recipe entirely because I didn’t have the need for a TON of cookies so keep that in mind if you are going to try this! The original recipe is below and will bake around 40 cookies! Mix together the flour, baking soda, cinnamon, cloves, ginger and salt. Cream together the softened butter and sugars until light & fluffy. Mix in the eggs and molasses. Gradually add in dry ingredients. Preheat oven to 350 degrees and line your baking sheet with parchment paper. Roll the dough into small balls and roll each ball into white sugar until covered. Bake for 8-10 minutes until the cookies crack slightly on top. 9 minutes was perfect for me! Transfer to a cooling rack and enjoy! I am a lover of all things that involve cinnamon. It is one of my favorite spices and instantly makes me feel all warm and fuzzy inside. This Cinnamon swirl bread was SUPER simple and was extra tasty when I dipped it in my coffee. The crunchy sugary topping was divine, I couldn’t stop snacking on it. You do need a loaf pan so make sure you have one before whipping up this tasty treat! Happy baking! Preheat oven to 350 degrees. Lightly grease a 9X5 loaf plan. In a small bowl, mix together 1/3 cup sugar and 2 tsp cinnamon and set aside. In a large bowl, combine the flour, baking powder, salt and remaining 1 cup of sugar. Combine the egg, milk and oil and then add to the flour mixture. Pour half of the batter into the pan. Sprinkle with half the reserved cinnamon/sugar mixture. Repeat with remaining batter and cinnamon and draw a knife through the batter to marble. I’m in love with a cookie. This chocolate salted caramel goodness from Gimme Some Oven is a winner. I rarely make chocolate cookies so this was something fun and different and I am definitely going to make them again…plus they were SO easy! 1 cup of butter…use unsalted! Beat the softened butter, sugar, eggs and vanilla in a bowl until light + fluffy! Combine the dry ingredients into a separate bowl and slowly add into the butter + egg mixture with chocolate and caramel bits! Line a pan with some parchment paper and roll cookies into a ball onto the pan or onto a greased cookie sheet and press those cookies down a bit, sprinkle with sea salt. Bake for 8-10 minutes, the sweet spot for me was 9! And go check out Gimme Some Oven! 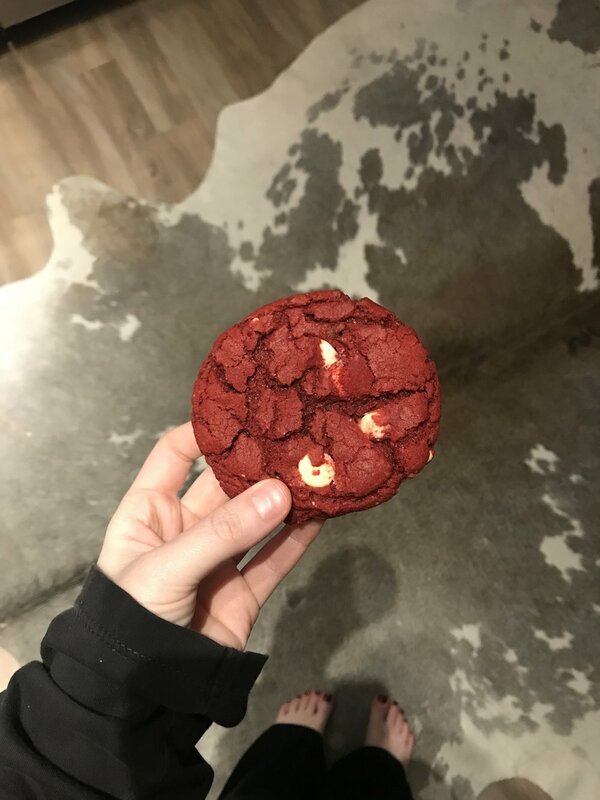 What are your favorite cookies to bake? Oh my god… I hit dessert jackpot. This recipe is PERFECT for any occasion but I am so glad I tried it out before the holidays. These cupcakes are dynamite and are the most harmonious combination of savory and sweet. The cake itself is deliciously spicy and the maple frosting is the perfect touch of sweet. Add some heath bar chunks and you get a yummy crunch of sugar on top! This is the ideal dessert for any friendsgiving party, holiday brunch or just because you are feeling it! Trust me, you want to make these…and your kitchen will smell fabulous! Cream the cream cheese, butter, maple syrup (get the good kind, trust me) and vanilla in an electric mixer with a paddle attachment. If you don’t have one a handheld should work! Make sure butter and cream cheese are at room temp…that is crucial! Leave them out on the countertop and be patient. Slowly incorporate the confectioners sugar and boom you have some maple frosting! In a separate bowl mix the eggs (room temp eggs are a must!) pumpkin, white + brown sugar and the vegetable oil. Add the dry mixture to the wet mixture and stir! This recipe is courtesy of my favorite lady Ina Garten! HOT DAMN this cake is so so good. I know I say this about a lot of recipes, but this cake is one of my favorites. I have made it several times before, and every time I fall in love all over again. At this point you have probably noticed I make a lot of Barefoot Contessa recipes, she is my cooking soulmate because her recipes are approachable, fairly simple and TASTY! This one does not disappoint. The best part…? No baking required? And theres booze in it…that’s good too. Before you run to the store to get the ingredient for this cake make sure you have a springform pan! Combine the heavy cream, mascarpone, sugar, coffee piquet, cocoa powder, espresso powder, and vanilla. Mix on low speed until the mixture forms firm peaks. Take your springform pan and cover the bottom as much as possible with the cookies, don’t be afraid to break them up! Cover with a layer of the mocha mixture and continue the process (cookies, layer, cookies, layer)….you get the point. Cover and place in the fridge overnight, you’ll be so happy the next day! Thanks Ina for the recipe! HEAVEN on a plate! I don’t often cook pasta, as much as I would like to have it everyday, I save it for when I REALLY want it. When I was in Las Vegas on my epic road trip, I had a chance to eat at Giada’s restaurant and it was amazing. This recipe is from her most recent book and it does not disappoint! Find the whole recipe + instructions here! Snickerdoodles literally warm my heart and soul. I love the smells and flavors of cinnamon, sugar and butter combined. Luckily these cookies are super easy to make and are always a crowd pleaser! Cream together the sugar and butter, add in eggs one at a time and vanilla. Shape the dough into 1 inch balls and roll in mixture of cinnamon - sugar (3 tbs sugar + 1 tbs cinnamon) and bake for 8-10 minutes at 350 degrees! I like to take them out a little early (on the 8 minute side) while they still don’t look cooked through…once they cool they will firm up but maintain the softness on the inside! It’s Fall y’all! I always love baking but it becomes extra special during the fall and winter seasons. The temperatures drop and it suddenly becomes much more cozy in the kitchen. These pumpkin muffins were super super easy! I used a recipe from Lovely Little Kitchen and adapted it just a bit. If you are looking to make your kitchen smell divine these are the muffins for you! I also found them not too sweet so they made the perfect breakfast snack…I actually dipped one in my coffee and it was beyond! I tried one right out of the oven and one the next day and they just keep on getting better! Happy baking!